What does the order in which your children were born say about them? The majority of parents have either said or heard these statements at some point in their parenting journey. I have even found myself stereotyping my children on more than one occasion with comments such as “Oh, he is all boy, always testing his limits. Or, “She’s so sensitive and quiet, such a little lady.” However, I begin to wonder if my son and his strong-willed behavior is a result of him being a boy or the result of him being my firstborn. Is my daughter overlooked at gatherings because she is so quiet or because she is the middle child? My questions and those of many parents can be answered by what some psychologists refer to as the Birth Order Effect. Each birth order comes with its own set of personality traits. Some children may possess all of the traits while some will only possess a few. As you read, chances are you will begin to see descriptions of your own children. One out of four children is an only child, making this personality fairly common. Only children love to be alone. They not only want alone time but they actually need it. The only child tends to be an organizer, scheduler and worrier. They are normally fair, dependable and have been known to throw tantrums to show power. The only child also has a tendency to have a sarcastic sense of humor. Is this sounding familiar to some of you parents of an only child? Now you can see why those temper tantrums seem so frequent or why you often find your child alone in his room being a “loner.” He is just the result of his place in the family. There are some similarities between the first born and the only child personalities. Why? Remember, all first born children were at one time the only child. Suddenly, another sibling has entered this child’s life and he must find another way to establish his family placement. Common personalities of the first born include perfectionism, reliability, conscientiousness, organized, list makers, critical, serious and goal oriented. As a result of having only adults as role models, first born children tend to be considered more advanced or “little adults.” They can develop into two basic personality types, compliant and pleasing or strong-willed and aggressive. First born children commonly go on in life to be leaders and achievers. It is no surprise that 52 percent of our presidents have been first born children. Birth order personalities develop in response to siblings, not parents. Therefore, the second born or middle child will develop traits opposite that of the first born. My older sister and I could not be more different. She is aggressive and I am compliant. She enjoys conflict, I am a peacemaker. Both of these traits I exhibit are common middle child traits. Other characteristics include meekness, secretive and good negotiating skills. Middle children have a tendency to feel left out of things at home or in the family. They have a hard time finding their place among first born children and babies. Middle children can show up in a variety of places in the family depending on the number of children. No matter the size of the family, the middle children can develop the same personality traits that become known as the middle child syndrome. These children may feel displaced, lost and angry, and they may look for outside companionship to avoid the hurt feelings as if they don’t belong at home. They often have a strong dependence on outside peer groups. Next we have the third born. As a result of many families stopping at three children, the third born is often the baby of the family. Third born children are usually the charmers in the family. They become the class clown and are usually good manipulators. They are also affectionate and uncomplicated. Underneath all of that charm they can be rebellious, critical, temperamental, spoiled and slightly impatient. The third born uses charm to offset the feelings of inadequacy the second born has so desperately tried to pass on. Fourth born children often develop the ability to deal well with people. This is probably a result of having to deal with all of those personality types growing up. They may also be great thinkers and able to manage challenging situations. They may also become analytical, hard workers and they can be pushy or passive. 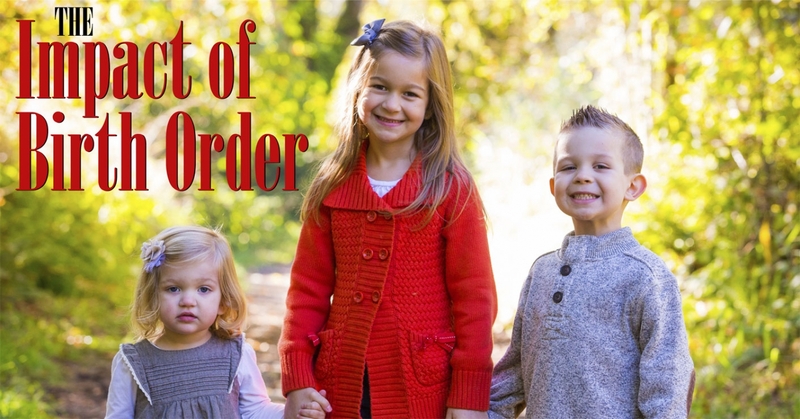 Some of you parents may be asking, “Why stop there; what about my other kids?” There are special circumstances that come with the Birth Order Effect. For instance, families with a large number of children will see the order repeat itself. After the fourth child, it starts over. Another circumstance is spacing between children. After a gap of five years, it is as if a second family has begun. In my family, I grew up with six kids with a gap of 12 years between the third born and the fourth born. You can imagine the family dynamics! This child needs time alone. Be sure you provide adequate time for this. Do not be concerned that your child will become anti-social. Be sure not to overload this child with too many group activities. Alone time is just as important. These children are sensitive to criticism. Do not be too quick to correct a problem or to improve everything. Spend time with your first born away from other siblings. Give special privileges for the oldest. Let the child stay up a little later, get an extra book, etc. The big thing to remember with this child is they need to know their place. Make special time to talk one-on-one. Plan special outings for just the two of you. Make a conscious effort to ask his opinion. Middle children will often not speak up in the midst of a debate. The last born tends to be less disciplined than the rest of the group. Make sure the rules apply to all children. Give the last born his fair share of responsibility in the family. Recognize accomplishments. Remember, the first time the baby ties his shoes is as important as the first time the first born did it. Shannon Torres is a freelance writer living in Colorado with her husband and three children. She has just recently started home schooling her 5-year-old son. Her favorite pastime is to generate story ideas from real life parenting experiences.